Earlier this year I featured Shaun Keefe who has developed a highly individual style of art. It’s guitar art or guitart for short. 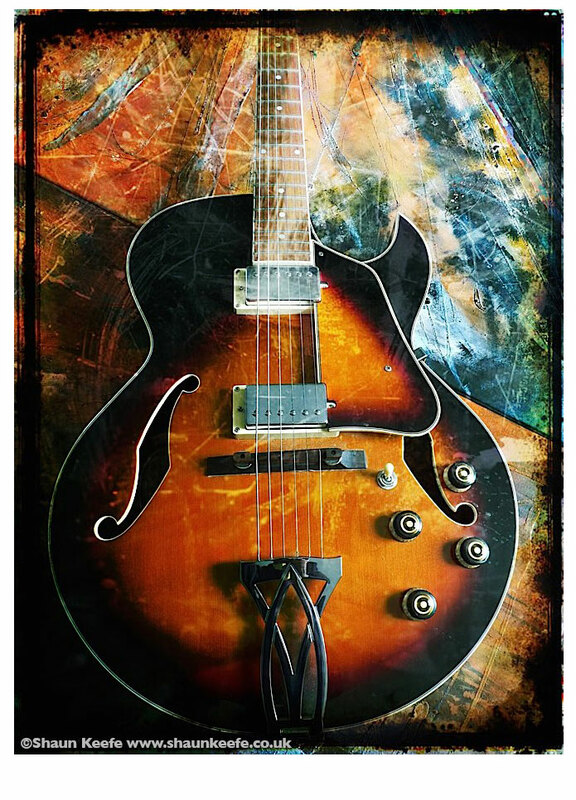 He takes high quality photographs of classic guitars, prints them out and then adds colour in the form of paint, to turn them into striking artworks. Now he has released a book of his guitart on the iTunes bookstore. It’s full of these sumptuously coloured and lovingly crafted images of guitars, along with explanatory text and a foreword by Rupert Hine, musician, songwriter and record producer. With their rich, saturated tones and detailed patterns and textures, these images come across particularly well on a computer screen. As you flip through the pages, the images fade or slide in and out, adding to the effect of an on-screen presentation, but it has the look and feel of a book that you could pick up and browse. 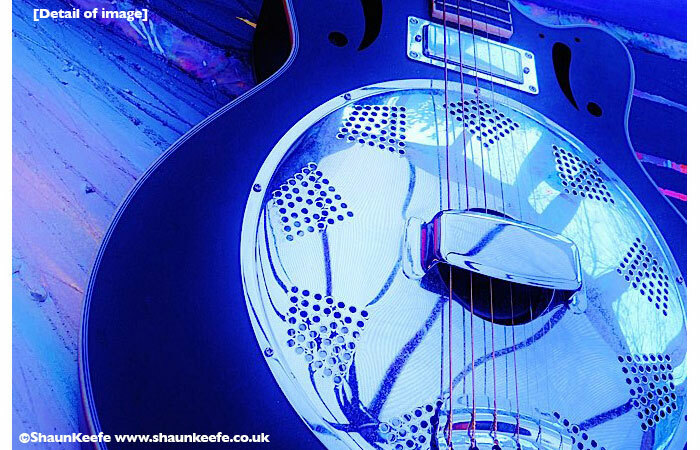 Shaun Keefe produced the excellent image of Eric Bell’s guitar which appears alongside my photomontage of the Thin Lizzy co-founder. The images are used on the cover of his 2015/2016 album ‘Exile’. 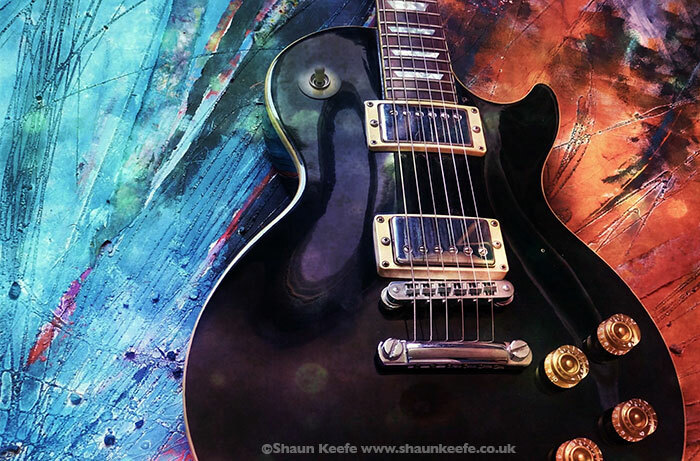 Here’s the audio slide show I did in early 2015 featuring Shaun Keefe’s images of guitars. One of the biggest influences on me was a neighbour who was also a school friend. He was into pop art and illustration. One day he asked me if I wanted to see the film of The Monterey Pop Festival at the Odeon cinema, Union, St Oldham, way back in 1972. The film was great, but for me, the big thing was the support film, the farewell concert at the Albert Hall by my all time favourite band, Cream. This film had a massive impact on me. I bought a guitar, or should I say, my mum and dad bought a guitar for me, from Woolworths. It was an electric guitar and at the age of 12, it meant the world to me. It had a battery powered amp so I didn’t electrocute myself! And so the love affair with music began. I took a few really basic lessons from a guitar teacher, I think was called John Nuttall. I ended up together with a few school mates and I tried to thrash out ‘Alright now’ – as people did back in 1974. At this time my interest and ability in art began to take shape, mainly due to a great art teacher, Mr Gallagher. One of the next big influences on me was when I went off to art college in 1978. There were gigs every weekend, clubs, festivals. I had an awesome time. After art school I pursued a career in advertising, so I’ve never been too far away from the excitement of the creative process. Since 2010 I’ve been a full time artist, combining painting and photography. And as I say, I’ve been playing the guitar for years, so music has always been a massive passion. I got great inspiration and influences from Cream, Hendrix and Zeppelin to The Stone Roses and Oasis. So all of this seemed like a good and enjoyable theme for the art that I produce today, which I call GUITART that’s G-U-I-T-A-R-T that’s all one word. In a list of design icons of the second half of the twentieth century, the electric guitar would be close to the top. And the people who love electric guitars are not just the people who play them. The whole world loves electric guitars. Everybody has their own favourite piece of music that remind them of a certain time, and the guitar plays its part in peoples’ memories. I want to plug in to this affection that people have with guitars. I try to combine the beauty, colour and style of guitars with my original paintings. The large canvases are a mixture of hessian, cotton, gauze and sharp sand. And for the paint medium, I use acrylics, with oils, pastels, emulsions, spray paint and inks. It’s a form of art that’s truly mixed media. 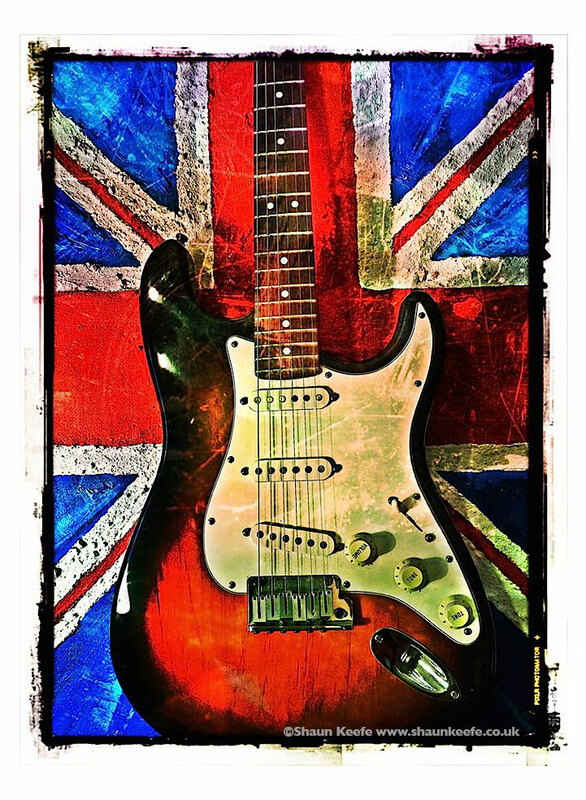 The finished canvases are then placed with various guitars in situ, photographed and treated in a range of photo effects. The images are then printed onto textured stock paper weighing 400 gsm. All are limited edition signed prints. In some ways I still behave like I did when I was 17, but without the same energy or hair! I’m just as interested in new bands like Chris King Robinson as well as classic performers such as Eric Clapton, and that continues to inspire the art I do today. ‘Unbelievable’ by EMF is one of the iconic songs of the Madchester scene, the music and dance movement that came out of Manchester in the late 80s and early 90s. Madchester is associated with the Hacienda night club, the bands New Order, the Happy Mondays, the Stone Roses and others, but most of all with Manchester, the city from where so many famous music acts originated. But, the band EMF and their lead singer James Atkin did not come from Manchester but the Forest of Dean, a remote area in Gloucester around 150 miles to the south. So how did a band from ‘the sticks’ come to create one of the defining records of its era? James was born in Birmingham and he moved with his family to the Forest of Dean when he was eleven. At school he met the other band members, and they started to rehearse together. They were booked to play a gig and needed some original material so they wrote ten songs, all of which were included on their album, ‘Schubert Dip’. They played gigs, built up a fan base of school friends and before long, the London record labels started to become interested in them. Only a small number of international artists have reached number one in the US singles chart with their first ever release. Within months, and without even sending a demo tape, they achieved the thing most aspiring musicians dream of: They secured a record deal. They were signed to EMI, who chose ‘Unbelievable’ to release as a single, and as they say, the rest is history. It reached number 3 in the UK Singles Chart and was a number one hit on the US Billboard Hot 100 chart. Only a small number of international artists have reached number one in the US singles chart with their first ever release, so James is in a very exclusive club. He was also nominated for an Ivor Novello award for his songwriting. The album ‘Schubert Dip’ reached number 3 in the UK Albums Chart. In 1991 James moved to London. He lived in Camden and got to know the London music scene with its different styles in different parts of the city. EMF then went on world tours. After EMF folded, he played with Bentley Rhythm Ace, a dance band. He toured the world with them as keyboard player, visiting Japan and Australia. Later in the nineties he had a deal with Polydor, doing break beat dance music. He released music, though not under his own name. During this time, he developed his production skills to a high standard, and in the early 2000s went back to university to train as a teacher. James moved with his family to the Yorkshire Dales and became a teacher of music technology. In 2014 he began to write songs again and recorded his first album in many years. It’s called ‘A Country Mile’ and the songs are in the electronic genre with strong vocals in his unique vocal style. They tell the story of his journey from the music scene in London to the remoteness of the Yorkshire Dales. I met up with James in Manchester’s Northern Quarter. First of all I asked him was what are his feelings about the Manchester scene in the late 80s and what does he remember about that time? Madchester is associated with the Hacienda night club, the bands New Order, the Happy Mondays, the Stone Roses and others, and most of all with Manchester. But, the band EMF and their lead singer James Atkin did not come from Manchester but the Forest of Dean, a remote area around 150 miles south of Manchester. They played gigs, built up a fanbase of school friends and before long, the London record labels started to become interested in them. Only a small number of artists have reached number one in the US singles chart with their first ever release, so James is in a very exclusive club. He was also nominated for an Ivor Novello award for his songwriting. Later in the nineties he had a deal with Polydor, doing break beat dance music. He released music, though not under his own name. During this time, he honed his production skills and in the early 2000s went back to university to train as a teacher. I met up with James in Manchester’s Northern Quarter. First thing I asked him was what are his feelings about the Manchester scene in the late 80s and what does he remember about that time? 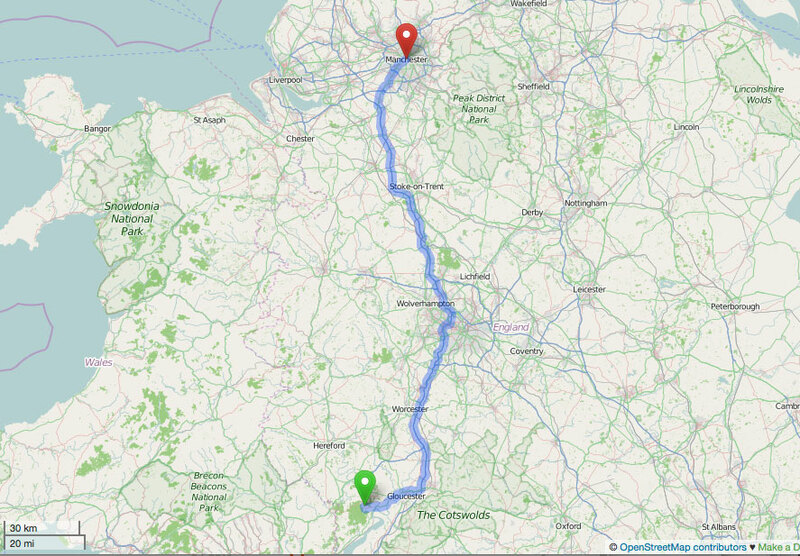 James: I guess we were living in a small village or a small area called the Forest of Dean, so the city we looked towards was always Manchester. And Manchester’s always had a great culture of music, especially mid eighties, late eighties and going into the early nineties. My original band, EMF, actually got their name from a Manchester band, New Order. There was an interview by the journalist David Quantick in the NME that mentioned New Order’s travelling fans as ‘Epsom Mad Funkers’ and we thought ‘Wow, that’s good, we’ll use that!’ so that’s where EMF came from. And do you know, the mid-eighties for us was all about The Smiths and later on as dance music came in, we were, kind of, looking at New Order, looking at all the bands that were happening at that time: the Happy Mondays and Stone Roses, and those were a massive influence on us. My first TV appearance, Top of the Pops, the first person I met was Clint Boon, a good Manchester lad, and he, kind of, took me under his wing, we kind of hung out in the studio together. We went to the BBC cafe, bumped into Shaun Ryder, and I was thinking ‘Wow, there’s all these kind of Manchester legends and they were all a bit scary to me, to be honest with you! Years later, playing here, I got friendly with Noel Gallagher. I had some downtime after a gig and he took me round, showed me the sights. This was before Noel was in his band (Oasis), so I seem to remember back then he was getting lots of respect off people. You could see where it was going with Noel Gallagher. We made it to the Hacienda, it was quite quiet. Manchester has been the centre of the world musically for me for a long time. And if you do look at my record collection, it’s littered with Manchester late eighties, early nineties bands. Aidan: And what about Manchester as a music city today? James: Well you know, I only live up the road now, so, when I need a dose of civilisation, Manchester is the city I come to. And it looks great, it’s vibrant! We go round the Northern Quarter, and we’re looking at these venues. We played Matt and Phreds, went down there, and that was a great venue, the Deaf Institute. (There’s) great stuff going on. It seems people are on it here. James: On Friday we’re playing the Ruby Lounge. I’ve got some great bands playing with me. And I think it’s going to be… I’m going to play songs from my new album, I might put a few little classics in there. I was kind of thinking whether to or not to, but I think it would probably be quite rude if I didn’t if I didn’t put a few old EMF tunes in there, so that’s going to be quite exciting for me as well because I haven’t done that for a long while, but I think it’s going to be a great night. It’s only the second gig of the solo album tour, and the band sounds great, so we’re going to have a really good time.